I'm a huge advocate for home machine quilting. The reason I started quilting my own quilts is because I'm self-taught, and when I started quilting 5 years ago, I thought that's what you DO! Little did I know (until I visited a quilt guild) that so many sewists send out their quilts to longarmers. 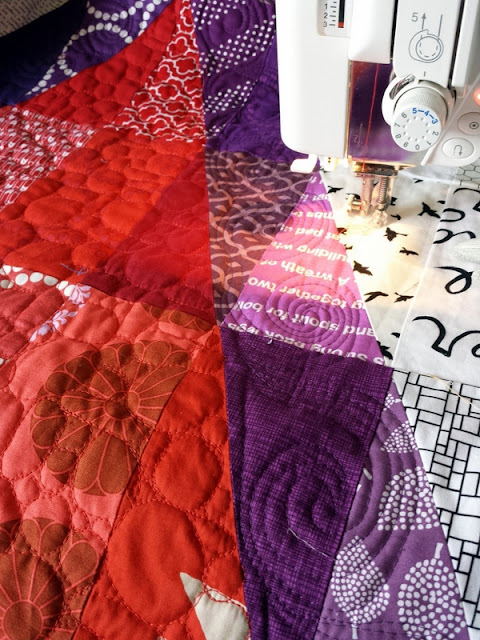 While I have many talented longarm quilting friends and I totally respect and encourage their services, I also think it's important for us to quilt our own quilts on our home machines. You can do it!! Sometimes I hear that some people "hate" to quilt, and it makes me sad inside. Please keep in mind that I'm not trying to change your likes/dislikes (I, for example, hate binding, and I don't think that will ever change). I would, however, like to present a different, more positive perspective! 2. You will finish a quilt from the very beginning to the bitter end. That is a huge accomplishment! 6. You aren't spending extra money on sending your quilt out. Some people want a professional finish and that's fine. I myself cannot afford to send out my quilts anyway (which means more money for fabric, thread, etc. - another reason I started quilting my own quilts). 1. Lift it up. Especially if it is a large quilt (bigger than baby), use another table, a couch, or a chair next to your machine to hold up part of your quilt. This reduces both the bulk that you have to move and the drag on your quilt (which can mess up stitches big time). I tend to line up two tables one behind the other to create a larger space for my quilt to lay. Sometimes I'll add a chair to the left of my machine, too. It all helps - spend the time to get set up. Here's my set up this week - this quilt is 72" x 72" and supported by two tables. 2. If you are free-motioning, don't look back! Everyone has to practice. No one becomes Angela Walters overnight (or ever, really, but you get the idea). You make mistakes and you move on. Really. 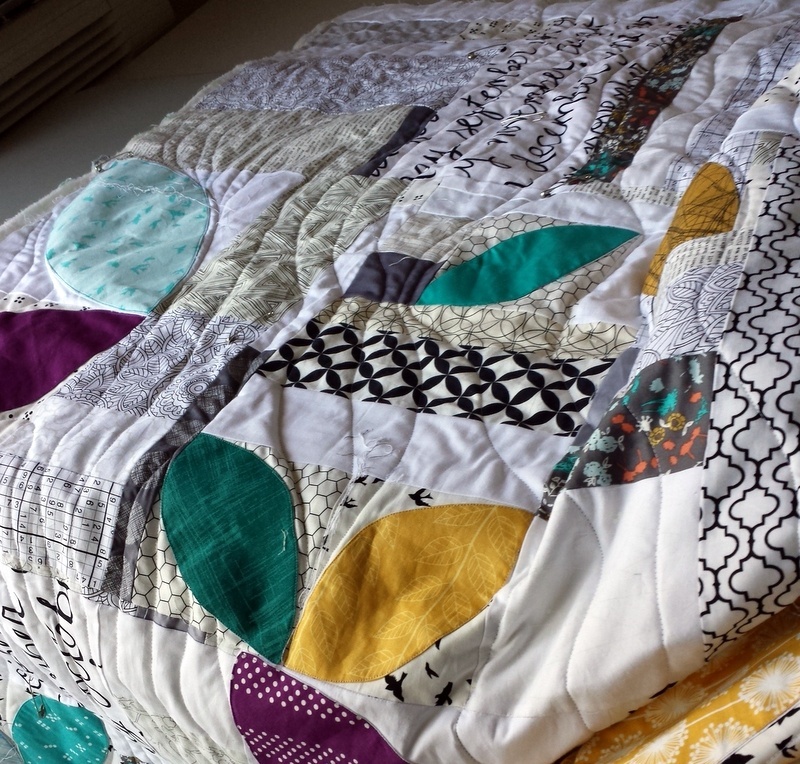 Use baby quilts and mini quilts to practice your designs. See my recent post on Sew Mama Sew about how to make practice quilt sandwiches to quilt with beforehand (and to learn more about adding straight lines to your free motion designs :) ). My quilting for Supernova in Blue didn't come out completely even (I didn't mark it) but I didn't tear it out. Guess what? Only I'm noticing it and showing you now. It's only a tad wobbly anyway. 3. Take breaks. I cannot stress this one enough - you can even set a timer to give yourself a friendly reminder to break. 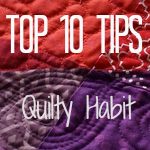 I usually quilt for 30 to 45 minutes at a time, and then step away to do something else. If you have room, it helps to have another project set up so that you can still cut fabric or hand sew while you are on a break. 4. Drink lots of water. Ever felt like making a quilt is a workout? Well, if not, you'll feel it when you quilt. For real. :) Stay hydrated and your body will thank you. 5. Stretch. Before, during breaks, after... you get the idea. You could also bug your significant other/siblings/parents/anyone with arms to give you a quick neck, shoulder, or hand massage. 6. Use tools to help alleviate arm, hand, and body tension. Such tools include quilting gloves (I use Machingers), Supreme Slider (a mat that helps your quilt slide as you quilt), and extension tables (they attach to your machine to give you more flat space, and they often come with machines). You may want to invest in a quilting table or desk that has an inset machine space, or get someone to carve one out for you. I hope to do this someday. 7. Prewind lots of bobbins! This reduces how much you will have to stop your machine and wind them. If I don't wind enough, oh well; guess I'll have to do that. If I wind too many, that's okay; they can be saved for another project. The key here is less stress! 8. Concentrate on one section at a time. You maybe want to roll your quilt up before hand (from both ends) so that just one part of the quilt is showing in the middle. Or, you could just stuff the quilt under your machine as you go (as I tend to do). 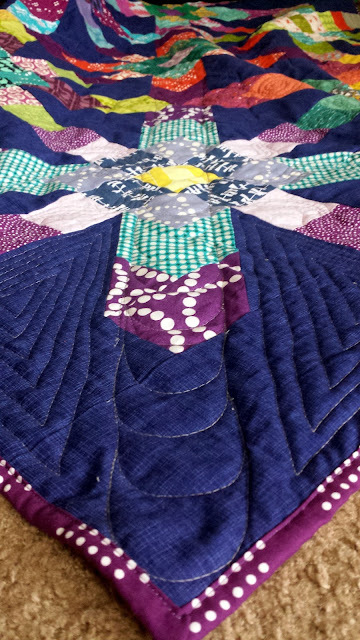 For this quilt, I quilted the purple first, then red. After all the colors are done, I'll go on to the low volume background. 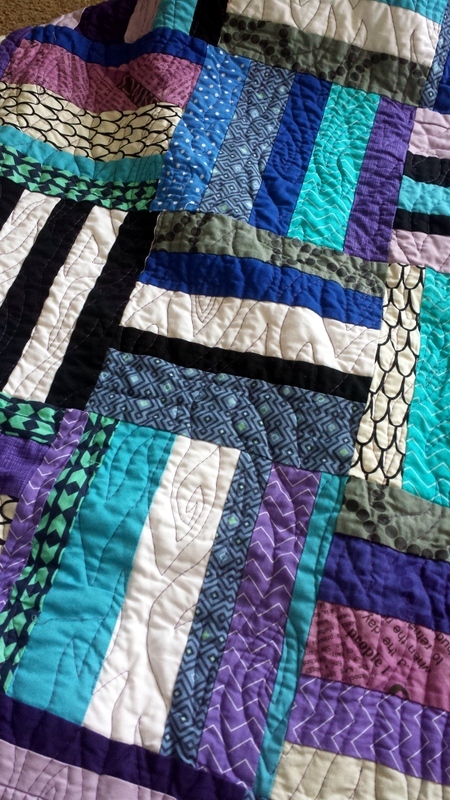 For Rainbow Wave, I quilted each color in a different motif, one color at a time, starting in the middle. 9. Choose the right design for your size quilt. For very large quilts (king size or bigger), it's going to be difficult to quilt detailed designs, no matter what your setup. For these quilts, I recommend long, wavy lines or straight line quilting to lessen how much you have to turn your quilt. This was my approach for Breeze, which is king size. I used my walking foot to power through the bulk. For Stripey, a large twin (60" x 70"), I quilted an all-over woodgrain motif. 10. Follow other quilters and find out what they do. Never has it been easier to virtually step into another sewing room and see what people are working on! I especially love Instagram for its instant quilting gratification (I'm @quiltyhabit). :) I love to ask quilters questions and find out what tools they use. 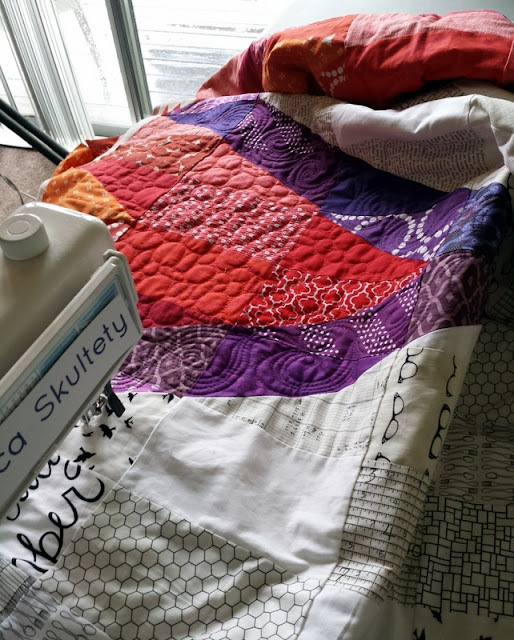 Some of my favorite home machine quilters include my lovely friends @quiltsnfeathers (Renee Hoffman, who has the same machine as me), @somelikeitquilted (Neva Asinari) and @christaquilts (Christa Watson). I also love to follow @leahdayquilting (Leah Day), @angelafmq (Angela Walters), and @afewscraps (Christina Cameli)! Finally, I collect images from all over the 'net of free motion itself on Pinterest (FMQ board); I browse this board whenever I'm getting ready to quilt something new! Do you have any other tips for quilting large quilts on your home machine? Top 10 Tips will be a new series on the blog, whenever a topic comes up. 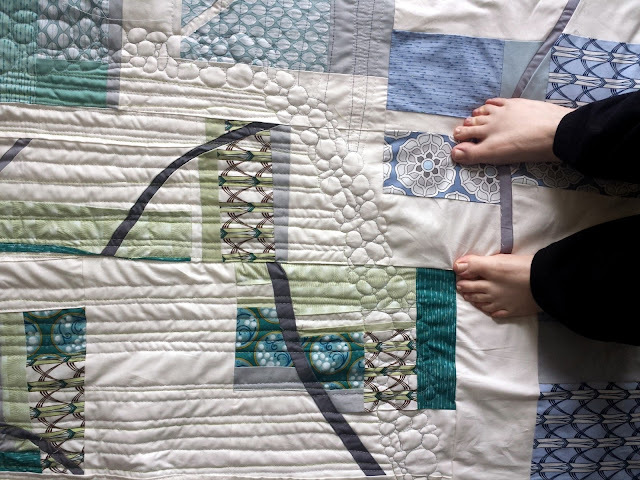 I hope you enjoyed this first installment, and that you'll try quilting your large quilts! Linking up to Fabric Tuesday at Quilt Story, Sew Cute Tuesday at Blossom Heart Quilts, Tips and Tutorials Tuesday at Late Night Quilter, WIP Wednesday at Freshly Pieced, Needle and Thread Thursday @ My Quilt Infatuation. I have a very tiny brother from Walmart! And I quilt at home for many of the same reasons as you. ;) For my last large quilt I added the batting in 3 sections- it was a huge help in fitting the quilt under the arm of my machine. I love that idea. Am working up the courage to start quilting my Gravity quilt and your idea sounds great so my arms don't rebel too much. This is a great post! Thanks for taking the time to put this in writing. You're so right about the stretching and hydrating. It definitely helps! BTW... I started on a tiny Brother from Wal-Mart too! You are so brave!!! I quilted 4 placemats on my husband's Singer (with just the normal foot on it - I didn't know there were different feet!) 8 years ago. My first 4 quilts I sent out to a longarmer, then I bought my own longarm - so much easier for me!! Leah Day just blows me away with what she accomplishes on her DSM! I enjoyed reading your post. Since I'm fairly new to quilting; having made a few quilts along the way but really getting into it now, I could use some top tips on the following concepts: using up old stash, buying new fabrics, putting colors together when making a quilt, cutting using a rotary cutter, pressing, measuring accurately, and choosing batting. great tips Jess - thanks for sharing. I think number 1 is what I need to work out first. I have had such difficulty trying to quilt larger quilts. I am interested in the supreme slider too. Do you use one? I use polyester batting (all I can find where I live) and it really doesn't slide that easily when I quilt. I wonder whether a supreme slider would help. I totally understand. I use the Supreme Slider and it helps move the quilt a lot. I live in a small town and it is a long way to the closest fabric shop. Amazon is my friend. I get my batting ( Soft and Natural) from them and they have every quilting supply known to man ( or woman!) Connecting Threads is another go-to place. The cotton battings slide well and can be quilted many inches apart. They are wonderful to work with. Keep having fun! Thanks for the great article! Think I should try the big one. Have done smaller lap size quilts before, but the queen size is a bit daunting. Found you on instagram! I just finished my first twin size quilt. Lots of mistakes! I'm with Karen Thurn, I am new and would like help with, picking out fabric, seams-which way to press and stitch them. Great tips, Jess! I also started on a very small machine. . . and my first quilt was a super sized king.... Go big or stay home LOL I had no idea what I was doing or that I wasn't supposed to be able to do it :) My usual advice to people is do what is comfortable for you! Read all that you can or take a class. Take what works for you and your machine (this is important as the whole controversy about feed dogs up or down is totally dependent on the machine IMHO) and leave.the.rest. I practiced on my quilt. . . I still practice on my quilts! 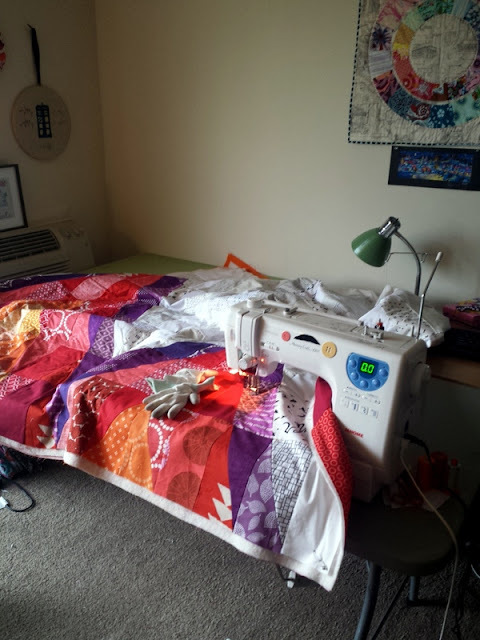 I quilt all my own quilts on my home sewing machine (even the one king-sized one I made), though I would love to try a long arm one day. I think it is so satisfying to quilt your own quilt yourself and know that the quilt is entirely the result of your own efforts. I do find it is very useful to use gloves while quilting, and to start by using a walking foot to put in the major lines/stitch in the ditch lines (where that fits the design) to stabilize the quilt so you don't need to worry as much about fabric shifting as you FMQ. I think it's only been the last 15-20 years that quilters have been sending quilts out to be quilted. Before that, the default was to quilt your own. I took a long break from quilting, and now that I'm back I've been quite startled by people shipping quilts off to the long-armer. It just seems so odd to me. I got to Stripey and immediately thought I need to do all over woodgrain on a quilt. I think I have one in the queue that I'll try it on. Thanks! I couldn't find an email to reply to, so I hope you see this! That is fantastic about your stippling! Customization is infinite when you can do it yourself :D. Congratulations! Hi Jessica! I just wanted to say thanks! I know this is an older post but I found this as I was searching for information on quilting on my SE400. I have been told I can do small quilts only and I must take larger to a longarm quilter and i hated the idea of someone else finishing my quilt. Your tips are great and I have newfound resolve :) Btw, I only took up sewing again a year ago with a few 4-H sewing projects in my background over 40 years ago. It was all about making clothes and wasn't a bit fun for me. Now, I find that I love fun projects and can't wait to make a quilt.